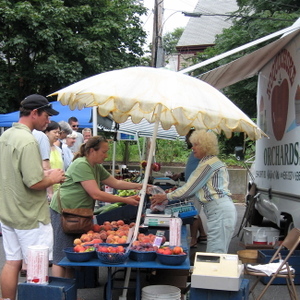 We've been very happy to have a farmers' market in Provincetown for the past few years. 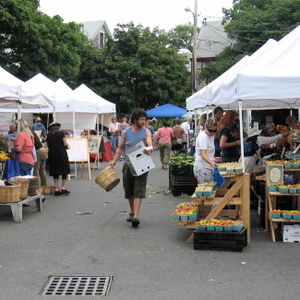 Each Saturday, a small parking lot near Town Hall sprouts white tents and fresh goodies. Our apartment rental begins on Saturday at 3 P.M., but each year we shop the market as soon as we arrive in town – even before we have a kitchen to stock with fruit and vegetables. Today, we bought ground cherries, corn, lettuce and tomatoes from Silverbrook Farms. Doris Mills from Noquochoke Orchards supplied us with peaches, plums, nectarines and a luscious cantaloupe. Our dining table now displays a lovely bouquet of hydrangeas from a vendor at the rear of the market, and our breadbox was filled at the Danish Pastry House stand. A big thank you to Andy Pollock, of Silverbrook Farm in Dartmouth for organizing this market and bringing fresh, local produce to the residents and visitors of this community at lands end in Massachusetts.